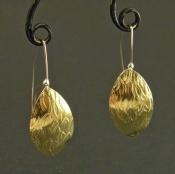 I only make a few pairs of this very popular style earrings per year. 18kt/sterling with a leaf pattern impressed into the gold, with sterling backside and spiral. Size: 2" long by 3/4"